In January, as part of DC's Blackest Night event, 8 classic titles rise from the grave for one more issue. However over a dozen books can be a bit of a hard ask for any New Years comic budget, so to help you decide which to grab, here's the wrap on the latest in our 1-0-1 series, the rise of Starman #81. 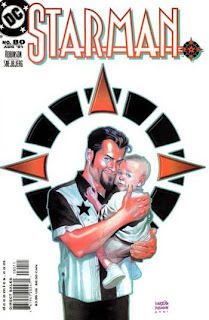 WHY YOU SHOULD CARE: Writer James Robinson's Starman was one of the truly cool comics of the 1990's. Standing out amid the guns, grimaces, 'bad girl' and splash-page laden books of it's time, the casually clothed legacy 'super-hero' Jack Knight, helped restore the industries focus on great stories, by concentrating on characters, rather than carnage... now Robinson returns, for one last issue. As The Shade's date sees him out enjoying the best Opal City has to offer, the former villain is forced to put things on ice, as a Black Lantern 'Starman' sweeps into town with death on his mind. While Jack Knight may be set to sit this one out, the all-star art team of Bill Sienkiewicz, Fernando Dagnino, and Tony Harris will ensure Starman #81 gives your eyes something to sparkle over. To find out how missed the Jack Knight character is - check out the Facebook group Bring Back Jack Knight as Starman!